Fingers are crossing among flower fans that a good showing is near. Reports will soon start popping among bud buffs as to where the best of the Anza-Borrego flowers are making their stand. IS JANUARY TOO SOON? Even as we SoCalers watch news reports of snow -- and more snow, and some more snow on top of that -- in places far from our warm-of-sand, sway-of-palms, blue-sky'd home, we can have trouble remembering that it is actually, truly and indeed and for real, winter. All of those aforementioned palms and the toasty beach sand and the soft blue skies can fool even a local longtimer's brain into thinking spring has arrived (and we're not alone; look at some of the shrubs in your neighborhood and try to tell us they're not toying with the idea of blooming). But January is firmly winter, in the Northern Hemisphere, though winter around Southern California is not the snowy epic it is back east. EXHIBIT A? Our regional deserts, if all of the elements come together and the rain has rained enough and conditions are just so, can start delivering flowers in February -- heck, make that January, as flowers have been spied in the Anza-Borrego. True, the first month of the year is a mite early for the serious seeker of flowers in the desert, but don't doubt for a second that people who love petals aren't already planning their February and March excursions into Anza-Borrego Desert State Park -- and beyond. Need some news to get you excited, and get you searching for the maps and routes you stowed last year? DESERT LAVENDER... has made a showing already in the A-B, per a posting on DesertUSA. Chuparosa also was bringing the buds as well. Does this mean the big ramp up is just down the pike? It can be tricky with flowers in arid climes, naming the exact week that those carpet-pretty sights show up, if they do show up, so keeping an eye come early February -- or even late January -- is key. As for the park's thoughts on the coming flower season? A statement from early January says staffers are "cautiously optimistic" about how the petal show will go for 2015. 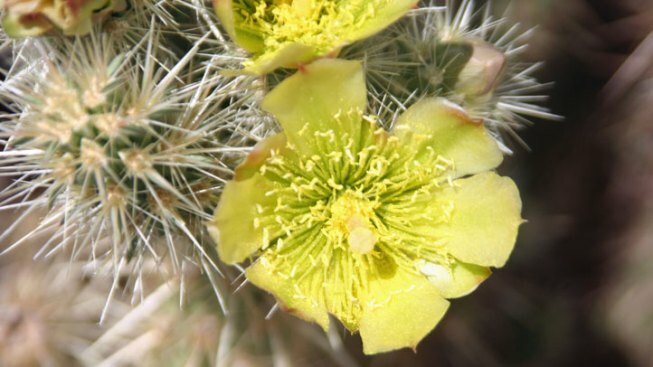 Keep watch here, and keep a bag near the door, in case a sudden spray of pink-topped hedgehog cactus or blue palo verde tree flowers make a surprise, and very welcome, showing.